The Passive Component Test Solution (PCT) consists of a family of modules, software and peripherals for testing insertion loss, return loss, length and polarity of optical test objects. Singlemode insertion loss / return loss module and EF-compliant multimode insertion loss / return loss module for the MPA-200 platform. 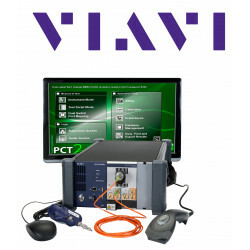 The Passive Component Test Solution (PCT) consists of a family of modules, software and peripherals for testing insertion loss, return loss, length and polarity of optical test objects. The modularity of the MAP-200 platform allows the PCT solution to be configured for R & D, production or qualification testing and covers all types of single-mode and multi-mode fiber applications from OM1 to OM4 .